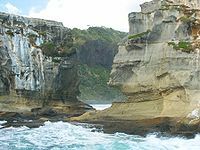 Kumeu is a small town 25 km north-west of the Auckland City centre in New Zealand. State Highway 16 and the North Auckland Line pass through the town. 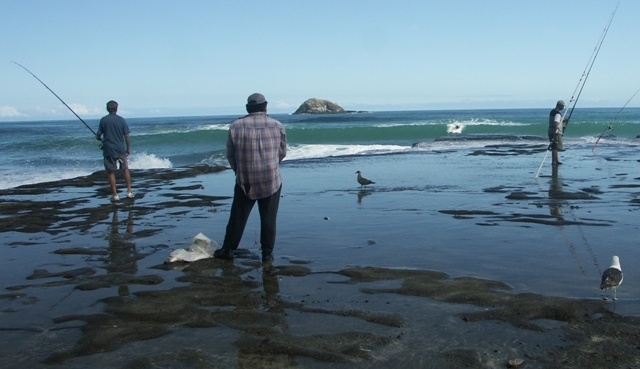 Huapai lies to the west, Riverhead to the north, Whenuapai to the east, West Harbour to the south-east, and Taupaki to the south. The population was 6,603 in the 2006 Census, an increase of 933 from 2001. The district was originally settled by immigrants from the Dalmatian coast of Croatia, many of whom were part of traditional winegrowing families. At the 2001 Census, the median income of people in the Kumeu area was $23,800, compared with $19,500 for Rodney District and $18,500 for all of New Zealand. The unemployment rate in Kumeu was 3.8 percent, compared with Rodney District percent for 5.1 and 7.5 percent for all of New Zealand. 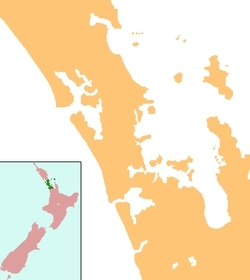 There were 775 business locations (geographic units) in Kumeu. 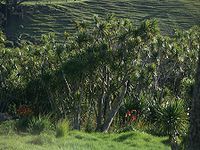 The areas surrounding the Kumeu district produce wine labels such as Kumeu River, Cooper's Creek and Matua Valley, and Nobilo's have gained a good reputation for their Chardonnay and Sauvignon Blanc wines. The wine growing district is the main industry in both Kumeu itself and the smaller nearby settlements of Huapai and Waimauku. The area is popular for lifestyle block farming and equestrian pursuits. The Kumeu Agricultural and Horticultural Society hosts one of the largest annual shows in the Southern Hemisphere on 34 hectares (80 acres) of land owned by the Kumeu District Agricultural and Horticultural Society, on the second weekend in March every year. The nearby localities of Woodhill forest and Muriwai Beach means it has strong recreational interests. The Kumeu Showgrounds are also the venue for the annual Auckland Folk Festival, a 4-day event of music, dancing and workshops, now in its 28th year. The festival is generally held over the last weekend in January. The North Auckland railway line passes through Kumeu, and for six years the town was the terminus of the isolated Kumeu-Riverhead Section railway. This line linked Kumeu to Riverhead, where ferries ran to Auckland, and operated from 1875 until 1881. In 1881, the North Auckland Line reached Kumeu, making the town a railway junction. This status lasted a mere five days; the new railway from Auckland made the line to Riverhead redundant and it was accordingly closed. In June 2007 it was announced that suburban rail services would be extended to Helensville in 2008, with temporary stations to be built at Huapai and Waimauku. The service commenced on 14 July 2008 for a one-year trial period. The only school is Kumeu is the state integrated Hare Krishna School, which is a coeducational full primary serving years 1-8 with a decile rating of 5 and a roll of 72. The majority of primary school-age students attend schools in surrounding suburbs. The closest secondary schools are Massey High School, Liston College, Albany Junior High School, Kaipara College and St Dominic's College. Some students commute by train to Marist College (girls) or St Peter's College (boys). This page was retrieved and condensed from (http://en.wikipedia.org/wiki/Kumeu) see Wikipedia, the free encyclopedia, January 2009.